Last month, the world's top overclockers came together to compete in the GALAX GOC 2015 Worldwide Qualifier contest for twelve places at the grand final in Wuhan, China this December. 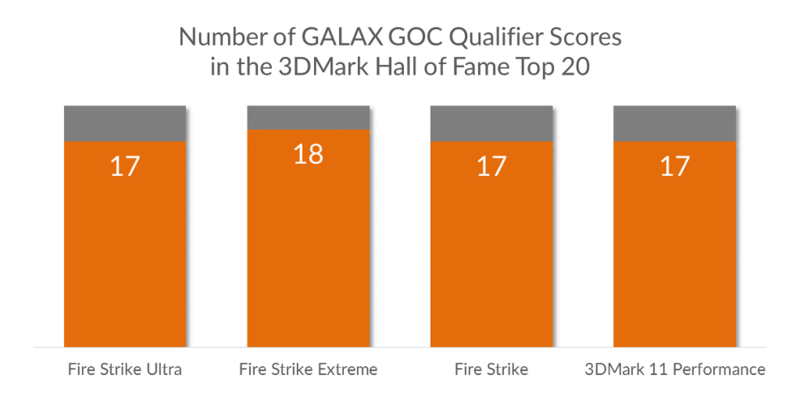 Contestants competed to submit the highest 3DMark scores in Fire Strike, Fire Strike Extreme, Fire Strike Ultra and 3DMark 11. After 36 days of intense competition, scores from the contest dominated the 3DMark Hall of Fame. Contestants claimed an incredible 18 of the top 20 Hall of Fame scores for Fire Strike Extreme. They also took 17 of the top 20 scores for Fire Strike Ultra, Fire Strike, and 3DMark 11. With great scores in all four benchmarks, German overclocker Dancop came out on top with 154 points - just 6 points shy of the maximum possible 160 points. The hardware powering these Hall of Fame scores is the new GALAX GTX 980 Ti HOF LN2 GOC Edition - the only graphics card in existence designed explicitly for cryogenic overclocking. The GALAX brand GTX 980 Ti was the card of choice for all 12 qualifying overclockers. Check out the competition page for more hardware details and the complete contest leaderboards.